The holiday season brings some of the year’s most joyous events; from visits with Santa, to listening to Christmas carols, to watching children understand that giving to others is far more important than receiving. For any family, though, this time can also bring about some of the most stressful moments of the year. 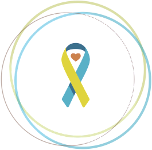 When a loved one has special needs, your family may experience even more challenges during the holidays. The constant barrage of bright lights, overwhelming smells, and all the extra people everywhere you go is difficult enough for most of us to handle. For some of us, it is especially challenging. However, by making modifications, the holidays can be magical for everyone. My oldest son, Alex, has Down syndrome. The time between Thanksgiving and New Year is especially hectic for our family, as we celebrate both Hanukkah and Christmas, with many family birthdays in between. As much as Al loves all the celebrations, he just isn’t able to tolerate the constant momentum of these never ending events. We’ve learned how to tone down some of the festivities, so that our traditions are more enjoyable for all of us. For example, instead of visiting Santa at the mall, we tend to favor less busy locations (for several years, we went to our local drug store to see Saint Nick!) because they aren’t as overwhelming for Alex (and my other kids, too!). 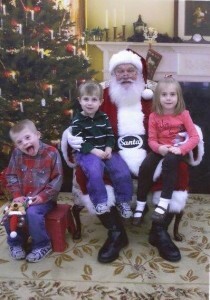 They don’t care if we aren’t at the mall; they get to tell Santa what they’d like to see under our Christmas tree, and I still get my annual photo. This year, we’re excited to see Santa at an event designed specifically for families with special needs. Fluttering Families, a non-profit organization local to us, hosts a wonderful event that allows families like mine an opportunity to visit with Santa in a quiet, private setting. Because my family also celebrates Hanukkah, we’ve made some modifications there as well. I was able to find the Hebrew blessing translated into English, so Alex can help say it each night as we light the menorah (again, this modification, that was inspired by Alex, helps my daughter and younger son, too!). Lighting the candles is more meaningful to him now that he can fully participate, and he looks forward to helping every night (now we just need to work on not blowing the candles out, like a birthday cake!). Another tactic we employ during the holidays with Alex helps him practice his speech exercises and manners. If we are out shopping, and he spots an item he would like to have, he first asks me to buy it for him. With a gentle reminder that Santa will soon visit, we’ve started encouraging him to ask the sales clerks to pass the message on to Santa that Al would like to have whatever toy has caught his eye in that moment. Not only is he gaining the confidence to independently ask for help while shopping (an important life skill! ), he is also helping teach others that individuals with Down syndrome are perfectly capable to shop and function on their own. The clerks we’ve encountered have handled these situations beautifully; I was especially grateful for an enthusiastic employee at a sporting goods store. 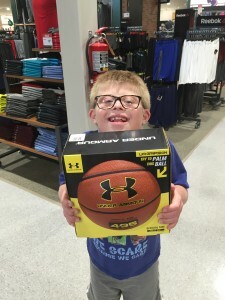 Alex had discovered a basketball that he decided Santa could bring, and he marched right up to the clerk with the ball and asked him to show it to Santa. That young man did not miss a beat, and promised to pass the message to Santa, which left Alex (and those around us) smiling from ear to ear. (And yes, Santa is indeed bringing that basketball this year!). All three kids excitedly talked about how decorating our tree, completing random acts of kindness missions left by their “elf”, and singing in the church Christmas program were among their favorite things about the holiday season. Alex especially lit up when I asked him what he would like Santa to bring him this year, and he quickly rattled off his list: “A microphone, a cash register, a basketball, that marble thing, and some cars!” When I asked what he would like to give to his siblings, his grandparents, and his dad and I, he looked me square in the eyes and said “I can’t tell you that.” I guess he thinks I might spill his secrets! As overwhelming as the holidays can be, I think it’s important to remember that we could all benefit from slowing down and enjoying the festivities on a quieter scale. Alex loves the holidays just as much as most children, but we’ve definitely had to make adjustments that best fit our schedule. While our holiday celebrations may look a little different, they are still festive and full of joy and love.